Portree walk, Trotternish peninsula, Skye, village of Uig, Glen Conon, River Conon. Stretching 20 miles north from Portree, the Trotternish peninsula has some of the finest scenery on Skye. It can be experienced first hand on this walk. The ascent, over gently sloping hillside, belies the true awe of the ridge, which only becomes apparent when you are right up on the craggy borderline between east and west. Start in the village of Uig, one of the main ferry ports for the Outer Hebrides. Set off up Glen Conon, on the minor road that leaves the A856 on the north side of the road bridge over the River Conon, opposite a newsagent's shop. Initially the road climbs steeply, through several sharp curves, but eases off to rise more gently by some cottages. The road undulates then ends by the last house. A muddy track strikes ahead, passing over a low step stile. It continues over open moorland, used for sheep and cattle grazing. Ahead, look out for spectacular waterfalls in the craggy amphitheatre down to the right. After about a mile of good track walking, the way disintegrates into an indistinct path over a short marshy section. It soon reaches a fence running at right angles. Cross over and follow the fence down to the burn a few yards away, then pick up a path that runs up alongside the water. 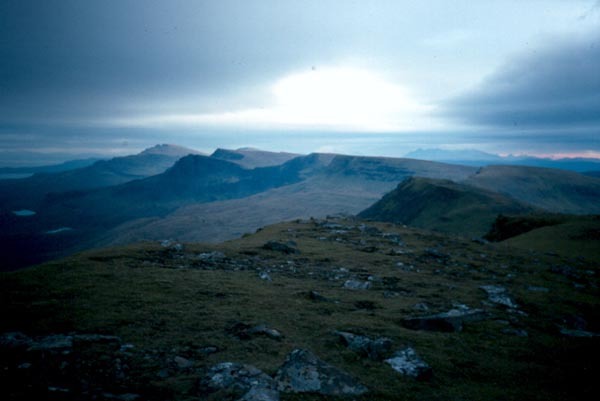 Ahead you can see the edge of the Trotternish Ridge. Aim straight for that point, climbing up into Bealach Uig. When your reach the crest of the ridge, turn right and follow it up on to the summit of Beinn Edra, using a rusty fence to assist with navigation. The climb is not particularly steep, but great care should be taken not to tread too near to the edge, as it drops away very steeply. The summit is marked by a trig point, surrounded by a low, circular shelter of stones. From here you can drink in the sheer spectacle of the Trotternish Ridge as it stretches south towards Skye's capital, Portree. There are also superb views west over Uig. Descend south along the ridge, then follow the path as it bears right, heading west down into Glen Uig. The route follows the Lon an t-Sratha burn down to the eastern terminus of a track, meeting it by a croft at Balnaknock. The track soon becomes a minor road, leading back into Uig. The final stretch drops steeply to join the A856. Once on the main road, turn right and follow it back to the start. Map OS Landranger 1:50,000 sheet 23. Start Junction of A856 and minor road up Glen Conon, grid ref NG 398639. Parking Small layby a short way from the start, by junction of A855 road to Staffin. Grading Minor roads, track and path over open hillside. Care should be taken on the ridge as there is a steep drop to the east. Sheep and cattle grazing means dogs should be on the lead.